Almost. 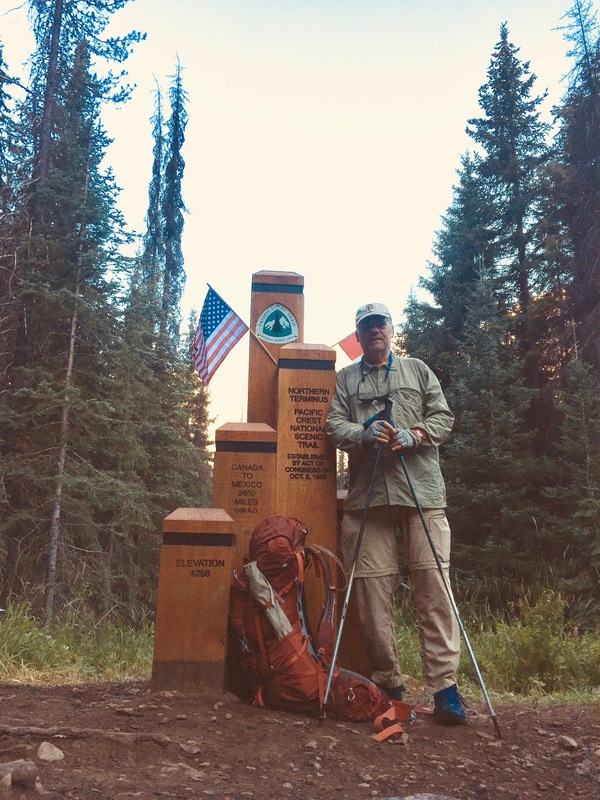 I still have to cross the Southern California desert and a couple other bits, but--hell yeah!--I made it to Canada, completed Washington, stomped down those rocky Northern Cascades. It nearly finished me, yet the PCT is mine. It is home. The roots, dust, flowers, trees, rocks, critters, birds and bugs, the smoke veil this year (every year?) -- it's all mine. A couple weeks ago, I saw a black bear eating berries and yelled, "Hey, get off my trail!" Stupid. He looked at me ... what? Yet it is mine as well as his. And yours if you climb up, over and through. You don't get to just look at photos or films though, you gotta earn it. 'It' is real. Everything real. No filters, phones, computers, TV. No one telling you what to think, buy, be, believe. Touch a tree trunk, a boulder, fingers in the grass, feet in the creek -- that's life. Not a representation or interpretation. No manipulation, the mountain doesn't care, it's just there. I sat by a lake thinking it would have been similar a million years ago. Freeze, thaw, repeat. Without me. Why do we do it? Why'd I spend six years walking up and down mountains? Sleep on the ground, poop in the woods, eat the same slop over and over? No easy answer, the answers are continually changing, foggy, a mystery, a beautiful mystery. But a space for the organic natural world -- I need this grounding. I need the silence, the solitude of high places. Perspective. As I flew south from Seattle to San Francisco, I could see the peaks that marked my long path: Cascade Peak, Glacier Peak, Mount Baker, Mount Rainier, Goat Rocks, Mount Adams, Mount Hood, Mount Jefferson, Three-Fingered Jack, Mount Washington, The Three Sisters, Mount Mazama/Crater Lake, Mount Thielsen, The Trinity Alps, Castle Crags, Mount Shasta, Hat Creek Rim, Mount Lassen and The Sierras. It was my journey through time and space backwards, a touching fly-over of memories. The flight took 2 hours, the walk 6 Augusts. Walking is best. Slow is deep. Next adventure? Life. Real, unfiltered, active.